Appalachia | EXCO Resources, Inc. Minimizing surface disruption from our well sites. Considerable effort is taken to select optimal well pad locations for our Marcellus shale operations. Initially a Geographical Information System (GIS) is used to carry out a desk top survey of proposed locations to check for important infrastructure. Once the general area has been approved, surface owners are contacted so that an agreement can be made with respect to accessing the surface. We strive to incorporate any reasonable requests made by surface owners into our site plan. Proposed well pad locations in Pennsylvania are analyzed using a State approved database (Pennsylvania National Diversity Inventory) which contains information on environmental values such as protected and endangered species. Even if there is no ‘hit’ on this database, independent consultants go out to the site and make sure that the development is not taking place in a wetland area and that no protected or endangered species are present. These consultants take soil samples from the area where the pad will be placed to get baseline information. Similar to our operations in East Texas and North Louisiana, we drill using multi-well horizontal pad drilling techniques to minimize surface disturbance. We have drilled up to six wells from a single pad, and typically we plan for four to six well pads in our development areas. Our pads average between five and seven and a half acres in size during development. Once the drilling is completed, the pad is reclaimed to a size of one to two acres. Well pad locations are chosen for optimal drainage characteristics that will protect the surrounding environment. The well pad area is cleared of other vegetation and leveled before rock is applied to prevent drainage through the pad. Protective linings are then utilized on top of the rock (felt and polyethylene) with matting boards being carefully applied to protect the liners from heavy equipment. We use extra casing protection through the surface and intermediate layers of our Marcellus shale wells for groundwater protection. Our Marcellus shale wells are constructed with two or more protective layers which can include mine protection casing cement, steel mine protection casing, surface casing cement, steel surface casing, intermediate casing cement, steel intermediate casing, production casing cement, steel production casing and production tubing. All production casing strings are cement bond logged in the vertical section to ensure proper zonal isolation prior to fracture stimulation operations. We pressure test wells prior to our fracture stimulation operations and typically apply advanced acoustic testing methods (e.g., ultrasonic imaging) to ensure the integrity of our casing and cement sheath. We monitor the annular pressure during fracture stimulation to ensure casing integrity and to ensure zonal isolation was maintained. Proper hole conditioning, casing running, casing equipment, cement slurry design, cement placement and verifying mechanical integrity prior to conducting fracture stimulation operations is integral to preventing gas migration. Casing pressure tests detect deficiencies before a well could create a potential safety or environmental problem. Considerable effort has been put into a cement evaluation program to improve the quality of our cement jobs for shallow and long strings. As an active member of the Marcellus Shale Coalition, we helped to develop recommended practice guidance in pre-drilling techniques such as water supply surveys, drilling and well construction, well completion and workover operations, wellsite production and facility operations, responding to stray gas migration incidents and contractor environmental and safety training. In order to ensure integrity of our production casing we install an additional string of tubing after the hydraulic fracturing treatment thus increasing the number of barriers and protecting production casing from additional exposure to pressure and corrosion. We proactively address water management issues in our Marcellus shale operations and endeavor to account for every gallon of water that is used and ultimately transported for disposal. We also implement pre-drilling baseline water quality testing in surrounding private water sources such as water wells, springs and ponds up to a distance of 3,000 feet from the well site. We are presently permitting new facilities specifically for the collective storage of flowback and production water to directly enhance our overall reuse and recycling efforts. We currently reuse 100% of flowback water from hydraulic fracturing activities and have a goal to reuse 50% of a well’s produced water. As required by the Pennsylvania Department of Environmental Protection (DEP), we create Water Management Plans on a development area basis. These plans describe the sourcing of water from a variety of options including local river systems, stormwater impoundments and groundwater. We have used water from other sources such as mine drainage water and municipal treatment works effluent in the past depending on the geographical location of the water requirement. Appropriate permitting is obtained from the respective regulatory authorities before any water is withdrawn (consumed). The focus is to acquire an approved and permitted water source that is in as close proximity to the well site as possible to lessen environmental and community impacts. Produced water that is not reused is collected immediately in steel tanks, processed and shipped to licensed and approved facilities for treatment and disposal. 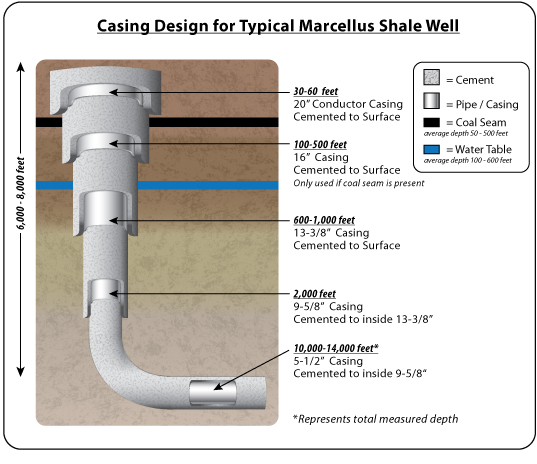 Based on current completion techniques, a typical fracturing procedure for a well in the Marcellus shale formation in Pennsylvania ranges from 11 to 16 stages and uses approximately 500,000 to 750,000 gallons of fluid per stage (93% of the gallons are water and approximately 6.83% of the gallons-equivalent are sand). Approximately 0.17% of fracturing fluid is composed of gelling agents and other chemicals depicted below which are publicly disclosed on a well by well basis on the website www.fracfocus.org. We understand public concerns about the toxicity of chemicals used in hydraulic fracturing and we work with our suppliers to minimize the impact of chemicals, additives and other products used in our fracturing operations. We have reduced the chemical make-up of our fracturing fluids over time and are committed to further reducing, when practicable, such chemicals. EXCO was an early adopter in Pennsylvania of the website www.fracfocus.org and has disclosed on that website all chemical additives used in its stimulation fluid on a well by well basis since February 2011. The website www.fracfocus.org is a joint registry created by the Ground Water Protection Council and the Interstate Oil and Gas Compact Commission. This website can be accessed by anyone, does not require a login or password and allows users to search by operator, location or well name. Information about the use of chemicals is also disclosed in our hydraulic fracturing completion reports that are required to be filed with the Pennsylvania Department of Environmental Protection (DEP). All operators including EXCO are required to file a completion report for each well stimulated using hydraulic fracturing. In order to reduce emissions from our Marcellus shale operations, wherever practical gathering networks are installed ahead of or at the time of well development to capture fluids and methane. Control systems are also utilized to minimize pressure relief during operation and water pipeline networks are used to reduce vehicle related emissions. We are also looking into natural gas powered rigs and vehicles where feasible as our fleets expand. Further, we are in the process of constructing a water management system in Lycoming County which includes a below-ground pipeline to transport water and drilling fluids. This water transport system will interconnect multiple water withdrawal sources, impoundments, above-ground tanks and well pads. This project, when completed, will reduce by at least 50% the necessary truckloads of water, which will reduce the overall emissions associated with our well completion activities. Additionally, traffic, dust and noise will all be considerably reduced through the reduced truck traffic. As is customary in our industry, we use outside contractors in Appalachia to perform drilling and hydraulic fracturing operations on our behalf. We rigorously review the qualifications of these contractors through an independent third party organization which includes review of safety programs and environmental and safety performance. EXCO implements a continuous safety practices improvement program with its contractors, and each contractor is required to undergo a comprehensive training program prior to working on location. The safety training includes risk awareness and accident prevention techniques, emergency response and first-aid protocols, and government notification procedures in the event of an incident. We carefully monitor contractor performance by keeping an independent drilling or fracturing supervisor continuously on location as well as independent safety representatives to confirm safe and environmentally sound operations. We meet regularly with our major contractors to discuss overall performance and how we, as a team, can perform even better. Additionally, we share our safety and environmental expectations with every contract employee that works on our locations and we require safety meetings before each shift. If any environmental release occurs, our contractors have clear instructions on how to report it. Finally, we maintain control of our locations through a security contractor that assists us in preventing unauthorized entry to our sites without proper training and equipment. We have completed a Social Impact Assessment in Pennsylvania to help inform us about local community concerns so those matters can be incorporated into our development plans and operations where practical. In addition, a Community Engagement Plan has been developed to ensure that the community is contacted and kept informed in a structured way about our development activities across the life cycle of the project. Examples of communication types around planning and operational activities include public town hall meetings, letters to landowners inviting them to meet to discuss upcoming seismic testing, telephone calls to county and township officials to let them know about activities that will be occurring in their specific geographical areas and information provided to county commissioners and county emergency departments and officials regarding specific events. We also maintain a hotline at (888) 788-3781 for anyone in any of our operating areas to report their concerns to us.